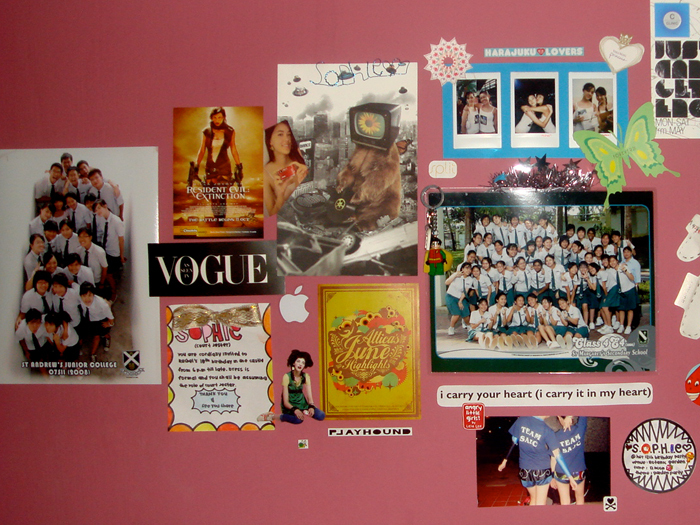 Here's a look at what I had up on my PREVIOUS wall. My current room's walls are white. Anyway back then my walls were painted 3 different colours - dark purple, light purple & fuchsia. This was beside my bed & I basically stuck random things on it. Well they're not TOTALLY random. Some are just nice pictures while others are mementoes. 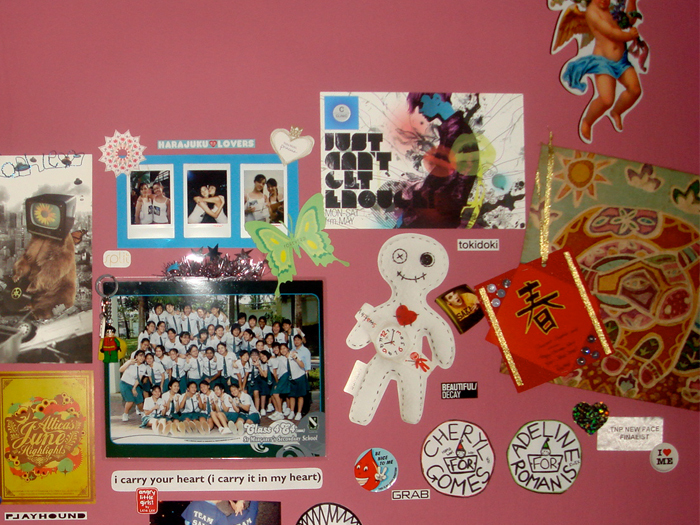 On the left is my SAJC class photo, with my secondary school (St Margaret's) counterpart in the middle. The two papers (one rectangle & one circle) that say SOPHIE are birthday party invitations done by my friend Sherry, who's really into the whole marker-drawing thingy haha. There is a movie postcard of Resident Evil (with Milla Jovovich) because I like zombie movies. The 3 polaroids on top were taken in 2006, when I went with other 2005 New Paper New Face finalist to scout for the 2006 ones! The scouting was done at Sentosa, at one of their events. The little smiling red droplet doing the twist sign is a sticker I got from donating blood in JC! "Cheryl for Gomes" & "Adeline for Romanis" were stickers I kept from when I was helping my friends campaign for House Council! I remember cutting these up & sticking them around the school. "TNP New Face finalist" sticker from the subsequent NPNF finals (can't remember which); they stick these on the seats to reserve them for alumni & I liked it cause it was a satin-y sticker! Above that is a Chinese New Year card & I have no idea what the character means. I found it amusing that my friend made me a CNY card. Like, who does that hahaha. I mean yeah Valentine's Day, birthdays, Christmas... CNY? Cute. And on the right of that is the batik painting I did in secondary school! That was actually kind of cool. The lines are drawn with wax! My old erm... "vanity area"? Hahaha. This is over at my light purple wall! The Roxy cap was a gift. Ok. I've always secretely wondered if that was a re-gift, a.k.a it was a gift my friend got but didn't want & gave to me. Guess I'll never know! So that was a look at me about 3 years ago! Oh crap that means I was 19. Scratch that, that was me from maybe 15-19. So the weirder stuff is from when I was 15. Yessiree. 8 comments on "What's On My Wall"
Wow your wall is interesting! I used to stick postcards on my wall but it peeled off the paint after I removed it. Got my walls repainted, decided to keep it clean so didn't stick anything. Just wondering, if you mind your photos and stuff get dusty, crumpled at the sides when you paste on walls? On the last picture I see a superman thingie, haha so cool. 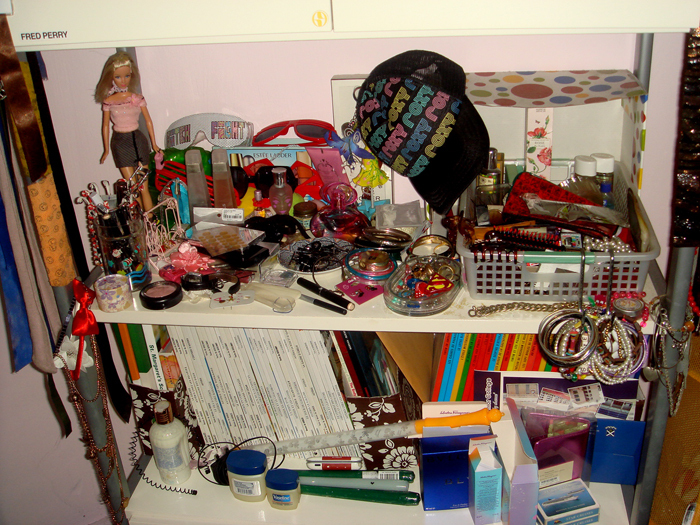 When I was younger my room was also full of random stuff.